But these opportunities come with additional risks—one of which is currency fluctuations. While currency can sometimes push equity returns higher, it can often pull returns down—and these fluctuations are typically a source of uncertainty. Currency hedging is a strategy designed to mitigate the impact of currency or foreign exchange (FX) risk on international investments returns. Popular methods for hedging currency are forward contracts, spot contracts, and foreign currency options. It enables investors to target local equity returns of international markets—and it may be simpler and more cost effective than you think. Imagine you’re on an airplane heading from New York to Los Angeles. The jet stream, which flows from west to east, is creating a headwind that slows down the airplane and makes the flight take about 6½ hours. Your return trip, however, will only take about 5½ hours, because the jet stream now acts as a tailwind that helps propel the plane forward. Currencies are exactly the same. Sometimes they are the tailwind helping push the security forward, and sometimes they are the headwind holding it back. But either way, they always make the ride more turbulent. Even the most sophisticated investors can wonder why currency is affecting them if their investment is in U.S. dollars. If you’ve ever traveled abroad, you know that sometimes your dollar buys more, and the goods you purchase seem inexpensive—and sometimes the opposite is true. This is because of fluctuations in the strength of the dollar compared to the currency of the country where you are purchasing goods or making investments. These types of currency differences can impact the value of your investment over time. Because currency may move in waves, trending one way or the other, it can significantly impact your investments over certain periods. Predicting which way it will go, especially in the short term, is practically impossible for investors. 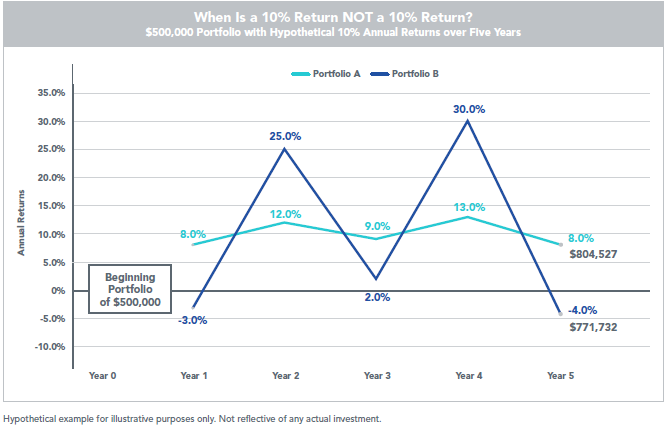 A portfolio's average annual returns are important—but they do not tell the full story. In the example below, portfolios A and B both start out with $500,000. Although it may not look like it, they both have average annual returns of 10%. After five years, however, portfolio A is worth just over $804,000, while portfolio B is worth less than $772,000. Why? Volatility. Volatility can cost you not only money, but time as well. In fact, the more your portfolio drops, the higher a return you will need and the longer it could take to get you back to where you were. For example, a drop of 30% will take six years to recover from at 6% per year, nine years at 4%, or nearly 18 years at 2%. And that is simply to break even. If you want to get ahead, you need to earn much higher returns or spend even more time. Fully hedged ETFs are designed to mitigate the currency exposure from an investment, regardless of market conditions. 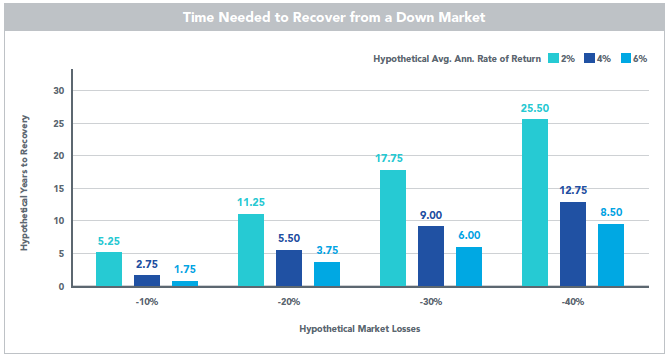 While this may impact returns positively or negatively, it can reduce overall volatility—and that can be critical for portfolio values. At WisdomTree, we have been implementing currency-hedging strategies in a way that is likely simpler and more cost-effective than many investors expect. The WisdomTree currency-hedged equity family of Funds implements WisdomTree’s currency-hedging strategies by entering into one-month forward contracts each month and rebalancing at month-end. Not only are many of the world's leading companies—and familiar brands—headquartered in Europe, but they are truly global companies that generate the bulk of their revenue from exporting to countries outside Europe. Our family of European hedged equity Funds offers investors a way to more fully access the return potential of European equities while hedging the effects of the currencies. Asian investments can be a smart addition to a portfolio, and now may be an opportune time to add Japan, as this country is undergoing exciting changes. However, history has shown that in export-driven economies, the equities typically go up when the currency is going down. That can erode investors’ returns. Hedging the yen can help reduce volatility. International investments should have a place in every portfolio, and now may be an opportune time to add them. 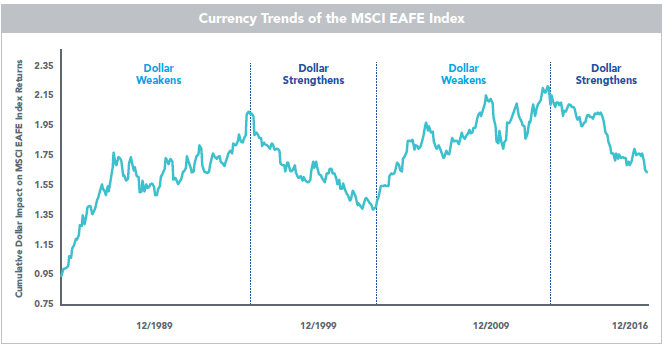 Of course, we believe that international equities tend to perform better when the U.S. dollar is strengthening—and if history repeats, we may be on the cusp of a prolonged period with a rising dollar. If the dollar is rising, other currencies are often weakening. Hedging them can help reduce volatility. Today’s investors can offset currency risk with fully hedged ETFs, or they can attempt to opportunistically capitalize on it with dynamically hedged ETFs. Full currency hedging is designed to mitigate currency exposure, helping reduce volatility and provide the equivalent of local returns. But what if you are interested in capitalizing on currency when it can help your returns? It can be very challenging for investors to determine when and how much to hedge. Dynamic hedging can help solve these challenges—using rules-based processes based on sophisticated signals to determine the right time to hedge and how much to hedge. Dynamically hedged ETFs attempt to determine the best times for a portfolio to be hedged. Depending on market conditions and specific quantitative indicators, these strategies automatically dial the currency exposure up or down. This may provide investors with the potential to opportunistically capitalize on currencies when they may help returns—and to avoid them when they may not. The WisdomTree dynamically hedged ETFs use rules-based methodologies and a proprietary signal overlay to determine the potentially best times (and amounts) to be hedged, or not to be hedged, automatically dialing the currency exposure up or down given specific signals. There are risks associated with investing, including possible loss of principal. Foreign investing involves special risks, such as risk of loss from currency fluctuation or political economic uncertainty. Funds focusing their investments on certain sectors and/or smaller companies increase their vulnerability to any single economic or regulatory development. This may result in greater share price volatility. Investments in emerging, offshore or frontier markets are generally less liquid and less efficient than investments in developed markets and are subject to additional risks, such as risks of adverse governmental regulation and intervention or political developments. Derivative investments can be volatile and these investments may be less liquid than other securities, and more sensitive to the effect of varied economic conditions. 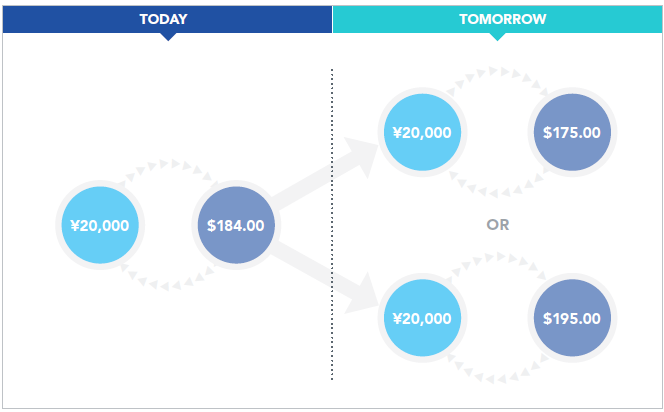 Some Funds focus their investments in Japan, the United Kingdom, Germany or South Korea, thereby increasing the impact of events and developments in Japan, the United Kingdom, Germany or South Korea, which can adversely affect performance. Investments in currency involve additional special risks, such as credit risk, interest rate fluctuations and the effect of varied economic conditions. As the Funds can have a high concentration in some issuers, the Funds can be adversely impacted by changes affecting those issuers. Due to the investment strategy of certain Funds, they may make higher capital gain distributions than other ETFs. Please read each Fund’s prospectus for specific details regarding each Fund’s risk profiles.